In one of my previous articles, I have explained the procedure of sending stamps to SOs. The same procedure is used to send IPOs except for adding the serial numbers of IPOs. 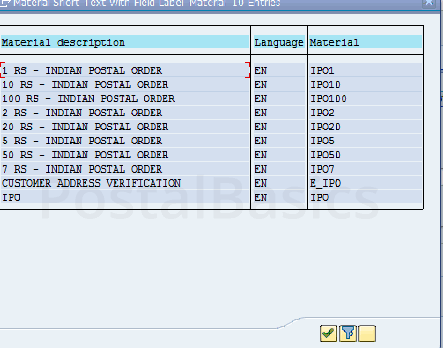 How to send IPOs in CSI Post office?? Go to SAP, enter the T-code MIGO. The below screen will appear. Once you have entered these details, click on the check box (5) and click on detail data(6) icon. Now, in the Material column, click on search button. You will get a pop-up window as shown above. Enter IPO in between asterisk * mark as shown in the picture above. Click on ✓. You will get a list of the IPO as shown below. Select the IPO which is to be sent. Enter the details as follows. Plant (7) Enter Plant ID. Hit Enter. Sloc transfer (8) TR01. Hit Enter. Sloc transfer (9) SO01. You can select respective sub-office from the search button. Hit Enter. Now, click on the Serial Number(10). You can see the window as shown below. Now click on the search button. A new window will appear. Here, I have taken the example of IPO10. 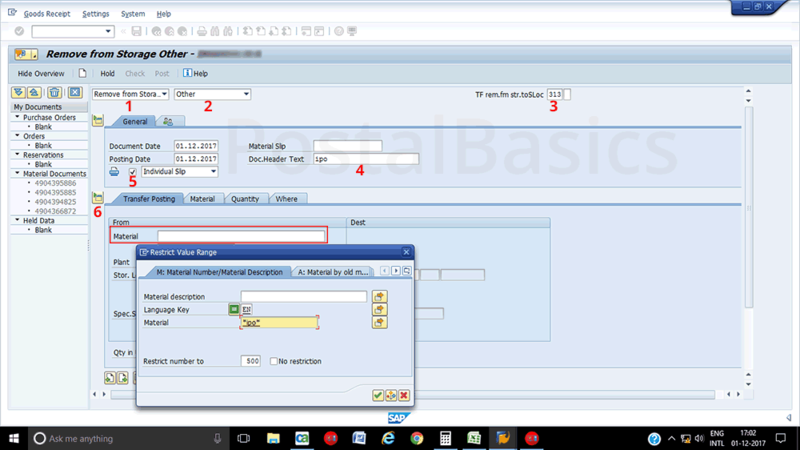 In order to select the serial number of IPO10, just click on the execute button. A list of IPOs will appear as shown below. 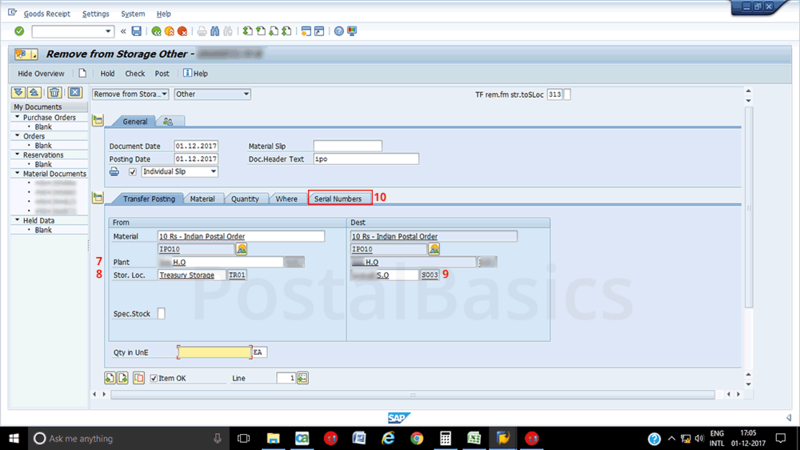 Select the series of IPOs which is to be sent. Click on ✓. 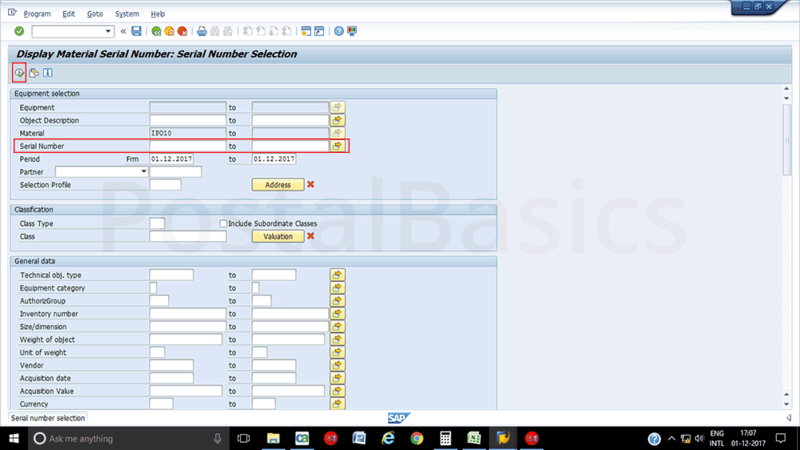 The quantity(11) column gets updated once you select the series. Click on Item OK (12). Click on Check button(13). Click on Post(14). A document will get generated. The sub-post office will receive the invoiced IPOs by using this same document number similar to how we receive the stamps from head office. Refer the article How to Receive Stamp Material in CSI Sub Post Office? to receive IPOs at Sub Office. The Same procedure should be followed to receive the invoiced IPOs at SOs. 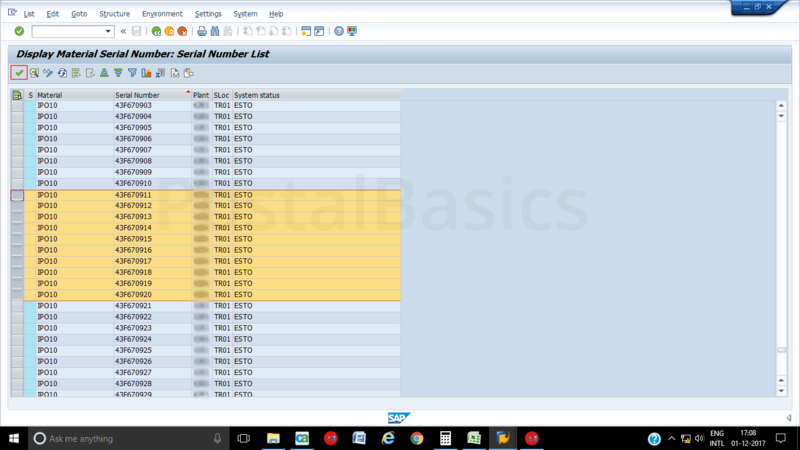 While receiving, you can check the serial numbers by clicking on the Serial Numbers column. For confirmation, type MB52 How to View Stamp Stocks in CSI Post Office? to see the IPO balance of your office.